Bless Unleashed is an upcoming Xbox One/Xbox One X-only MMORPG that is being developed by Round 8 Studio and published by BANDAI NAMCO. Unlike most MMORPGs, Bless Unleashed takes a different tact on the title’s core gameplay by focusing on single player action combat with combo trees that are activated with a series of button presses. In a time where the mortal and the divine had long since split apart, one such deity, Lumenas, attempts to break free of her confines to wreak havoc on the world. There will be five classes available for players to enjoy at launch, and the game will be free-to-play after the initial purchase. 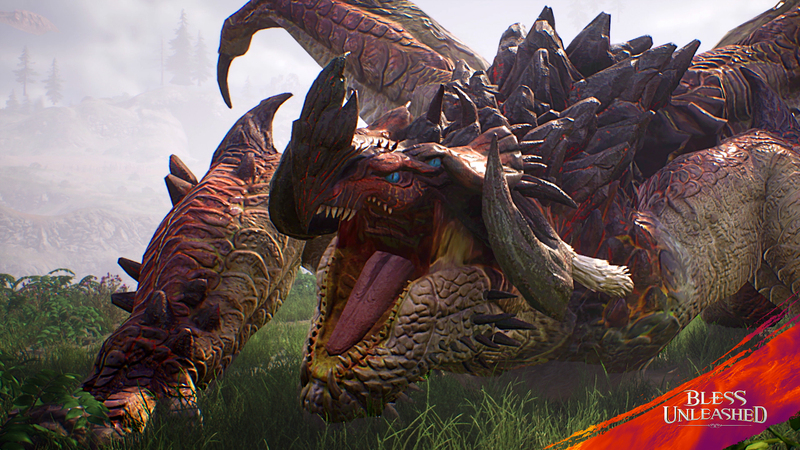 During GDC 2019, I caught up with the producer of Bless Unleashed, David Jalosa, and we talked about the jobs that will be available at launch, how level progression will work, endgame, the content update schedule, microtransactions, and more. Bless Unleashed is coming out for the Xbox One / Xbox One X in 2019. You can find out more about Bless Unleashed by visiting their website Website, liking them on Facebook, tweeting them via Twitter, following it on Instagram, subscribing on YouTube or the official subreddit, or watching on Mixer and Twitch. You can also check out my hands-on impressions of Bless Unleashed from GDC 2019 here. David Jalosa: I am David Jalosa, producer on Bless Unleashed. OR: What is Bless Unleashed? DJ: Bless Unleashed is a free-to-play MMO [that] is coming out on the Xbox later this year. It is a game where you choose your class. And whether it be ranger, priest, berserker, or mage- you enter into Upworld, where the gods are at war with each other, and you’re playing some sort of part in that. As you enter into the game, you’re on a small island and you’re trying to figure out who you are, what’s going on, and ideally- you do that through the story. And you team up with friends for raids and dungeons. [There is also] crafting, all those things that you find in a typical MMO. OR: There is another game similar to this, Bless Online. How is Bless Unleashed different from Bless Online? DJ: The only thing that they share are art assets, the kind of story and lore and the world, and the name Bless in the title. Bless Unleashed was made for the Xbox One/Xbox One X from the ground up [with] a different team and different publisher. We really wanted to focus on action/combat in the MMO space. 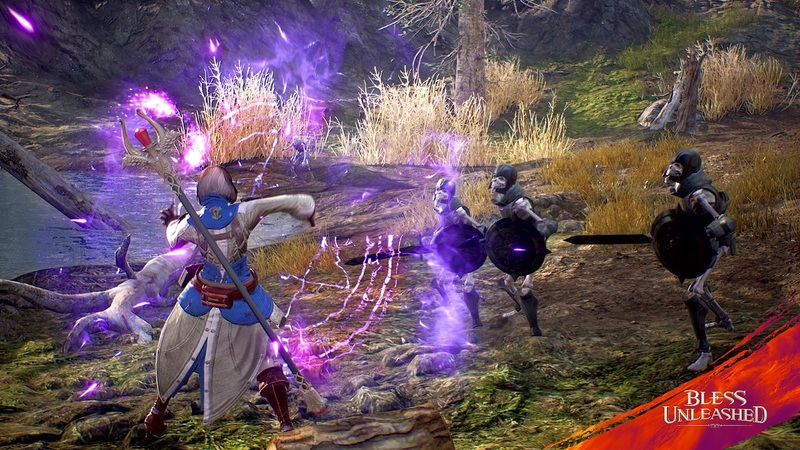 So unlike the tap-targeting that you might find in Bless Online, this is more ‘twitch-based’ combat that you might find in Monster Hunter or Dark Souls. The stories are different. The gameplay [is] really simplified and made for that enjoyable console experience. OR: Do I need to have previously played Bless Online to ‘follow’ [Bless Unleashed]? DJ: Nope. Not at all. OR: So what classes/jobs is Bless Unleashed launching with? DJ: We are launching with the Crusader class, which is like the mid-range class. He has medium armor, medium speed, medium ‘hits’- it’s pretty cool. You have your Beserker class, which is your slower moving but really heavy hitting class. You have your Mage, which is your ranged DPS magic class. Your ranger, which is another ranged class, but with a bow and you’re really agile. And your have your Priest class, which is also high DPS but also has skills that can help heal up your party. OR: Are there any more classes coming? DJ: There might be. There’s others that will come, but we don’t know when. I know there was a reference to an ‘Assassin’ or what-have-you, but I don’t have any information on when that is coming post-launch. OR: How challenging is Bless Unleashed for a new player to get into? OR: But I have quite a bit of MMO experience, that’s the difference. DJ: Sure. But it’s pretty easy. I think the combo systems are pretty simple. When you’re playing the demo here, you’re already at max level and skills. When you get in, you only have one skill. And as time goes on, you get more. But we really wanted to make it so it’s really easy to pick up and play and have fun. And as you spend time with it, it will slowly get more and more complex. OR: You mentioned as you’re leveling- what’s the emphasis on leveling? Are you wanting players to go kill enemies to gain experience, to do quests to gain experience, a mixture of both? How does progression work [in Bless Unleashed]? DJ: A mixture of both. So when you start on the game, there will be this story that you’re trying to uncover and unlock. And you’ll be getting experience points for going through that story progression. Through that progression, you may need to kill some bad guys that are about to invade, or you might need to deliver a secret note to someone. So as you’re going through, you’ll find a mixture of both. There’s also things you’ll encounter along the way of that story progression, whether it be side quests, a field boss- you could be going down the road and see this giant ogre that’s wreaking havoc, and you can jump in with other players and kill him for experience that way. There’s a little bit of everything, so players can pick and choose what they like. Mostly, until endgame, you’ll be playing through a specific story. OR: What’s the level cap at launch? DJ: I believe it’s level thirty. OR: There are five different jobs here [in Bless Unleashed]. If I wanted to play as a different job, do I have to roll a new character or can I just reset my character’s class? DJ: You have to roll a different character. 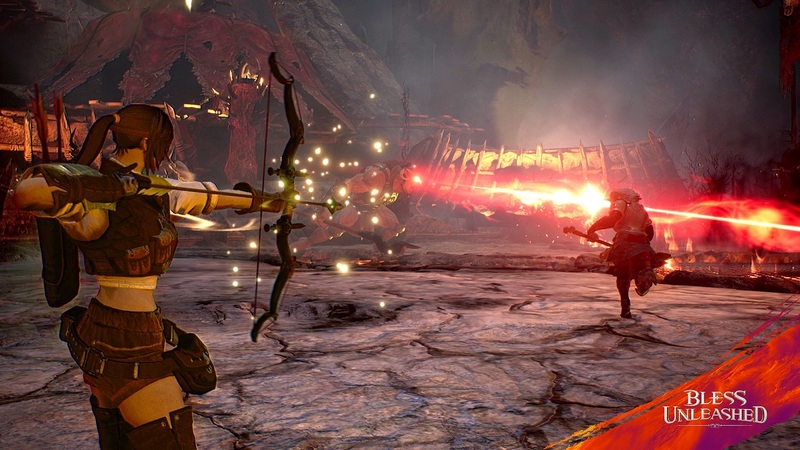 Berserker and Ranger are just two of the classes that will be available in Bless Unleashed at launch. OR: You mentioned endgame. How do you anticipate endgame working in Bless Unleashed? DJ: Post-launch, we will have this faction-versus-faction play. I don’t think that’s going to be for full launch. For launch, we will have PVP battlefields. So there are leaderboards there. There’s going to be housing farmstead and lots of crafting. And different types of endgame quests that you can participate in and in which you can get crafting materials, armor, things that will aid you in whether you’re enjoying housing or enjoying the fifteen-versus-fifteen PVP or dungeon raiding. OR: You just mentioned fifteen-versus-fifteen PVP. Can you tell me a bit more about that? DJ: So that’s going to be a battlefield-type system, similar to what you’ve seen in World of Warcraft battlefields. So there’ll be this place there it’s fifteen-versus-fifteen, and there might be certain objectives within the battlefield, and players will go at it. After a certain time period, you’ll be ranked on kills, deaths, what-have-you. After you complete the battlefield, you’ll get a type of point- I’m not sure what they’re called yet, but I want to say ‘honor points’, but that might be WoW– but you’ll get points that you can then spend in a store to get PVP gear. OR: Do you have to play PVP to get some of the game’s best gear? DJ: You might get PVP gear, but you do not. “That being said, it’s a live game, so there will always be something going on. OR: You mentioned earlier that it’s a skill combo based system. Can you explain a little bit more about that? DJ: Every combat class will have different combos. If they’re timed right, they get EXP and the very last [attack] in the combo is some sort of heavy-hitting attack, whether it’s AoE or what-have-you. And then we also have skills, or what we call ‘Blessings’- these are your typical MMO skills such as a protection shield or a health AoE for your party, and you’ll be able to swap these things out. Blessings are what you’ll earn through quests or purchasing so you can further customize how you want your character to perform. OR: This is fairly self-sufficient gameplay [in Bless Unleashed]. What incentive do players have to work with each other? DJ: They’ll work with each other for field quests, they will be some bosses that you can’t just beat by yourself. They’ll be some harder dungeons where you can’t complete by yourself. And raid bosses. OR: One of the biggest challenges in any MMORPG is managing money creation in order to prevent runaway hyper-inflation in the marketplace. What currency and resource drains are there in place in Bless Unleashed to combat that problem? DJ: Right now, we have a marketplace that we will have in game. We will not have player-to-player trading. So will be able to control the economy a little better. There will be a housing and crafting system that will require resources. So you collect resources, and then they will be ‘sinks’ for that. So if you want to have the best armor or what-have-you, then you will want to do it through crafting, then there will be ‘sinks’ for that. Likewise, if you want to run dungeons, you will probably want to have buffs and materials to bring with you, so there will be ‘sinks’ there as well. Obviously, we’re going to be monitoring all this data on the back end, and have failsafes. So if we see inflation happening, we can do something about it very quickly. There are a variety of enemies to fight as one of five jobs when Bless Unleashed is released later this year. (Images courtesy of BANDAI NAMCO). OR: This is a console-only title for the Xbox One and the Xbox One X. OR: What are some challenges for creating a console-only MMO? DJ: Controls are one, making sure that they’re reactive and fun. I’d say that the ten-foot experience versus the two-foot experience. So you UI is another one. MMOs, as you know, are very UI intensive. Lots of sub-menus upon menus. So we’re really working through those menu systems so that they’re fun. And to go back to combat- you want players to have lots of different skills, so there’s lots of variety and decision making in combat. And to be able to have players understand and be able to go to those skills without thinking about it. So I’d say that’s the bigger challenges. OR: How are people going to be able to communicate while in game? Are you going to allow them to type in? DJ: There will be an in-game chat, so they can chat in with the keyboard controller, or the keyboard that comes up [virtually]. There will also be voice-chat enabled, so there will be lots of ways for players to be able to communicate. OR: How does this tie into Xbox Live? Can players chat through Xbox Live while playing? DJ: Yes, I’m fairly certain. OR: Moving on- one of the lifebloods of any MMO is new content. How often do you anticipate updating the content to the game? What is the content cycle [for Bless Unleashed]? DJ: I believe, right now, we’re looking for every three months. That being said, it’s a live game, so there will always be something going on. Whether it’s a sale, whether it’s a new costume or small, little thing to get players through those three months. Because we always want to be doing something, we always want to be active with our community. There’s always something to look forward to, but we’re looking forward to big content drops- which is storylines, dungeons, things like that- about every three months right now. Obviously, we’ll look at the data as it comes in and see what works for our players. OR: Now you mentioned interacting with the community. How do you plan on doing community outreach for Bless Unleashed while the game is ongoing? DJ: We will have all the standard community channels. We will have Discord, reddit, Facebook- we have a whole customer service team that is ready to hear player feedback and player concerns. And community managers that will be interacting with the community [in order to] really get a sense of the ‘heartbeat’ of our community, because, in essence, that is the ‘heartbeat’ of our game. OR: Late last year, y’all announced a beta. Can you tell me a little more about the beta- when it is coming out, what content it will cover, and such? DJ: I can tell you a little bit. It is coming out soon. In probably the next two months, it will be the beta. I cannot tell you how big it will be yet. The content will likely be capped, maybe at the realm of level twenty or so. That’s still to be determined, but you will be able to play through the beta weekend and have a good time. My personal favorite job to play during my hands-on time with Bless Unleashed at GDC 2019 was Archer, and it turned out to be Mr. Jalosa’s favorite job too. (Image courtesy of BANDAI NAMCO). OR: Will the beta content carry over to the final game? DJ: No, it will not. We will have a head-start for ‘Founder-pack’ purchases. They will have a few days headstart. But if you play in the beta, we will give you a little ‘something’ for participating. But your progression will not carry over. OR: You mentioned ‘Founder-packs’, could you explain a little bit more about that? DJ: I don’t know the price points right now, but they’ll be different tiers and they will come with exclusive items, such as costumes, mounts, some consumables that have yet to be determined, that will just enhance your gameplay experience. They will also get you into early access, that is the big draw in my opinion. OR: So Bless Unleashed is free-to-play. Usually, when you have free-to-play, there are microtransactions. Could you tell us a little bit about how you plan on implementing them into Bless Unleashed? DJ: So one thing that we’re really cognizant of is, especially in the MMORPG community, is the pay-to-win aspect of games and how negatively that perception can impact the community. We’re very cognizant of that. So, for right now, we’re planning to sell lots of cosmetics. We’re talking costumes, outfits, mounts, things for your house and homestead and what-have-you, in addition to convenience items. So we really play with that time-versus-money aspect of monetization. So we don’t plan to sell ‘power’, we know how toxic that can be. But there might be things that ease your convenience so [if] I pay a bit of money, I can get those things a little bit faster. OR: Yesterday, Google just announced their Stadia. Are there any plans to bring it to the Google streaming console, or to the PlayStation 4, the Switch, or the PC? DJ: No, as of yet. Really, we’re just focusing on Xbox One. We want to get this game solid and good and playable. Once we feel good there, then the world is our oyster. Others will happen, but for now, all our efforts are getting this version as good [as possible]. OR: Final question- for someone who may not have heard of Bless Unleashed until GDC or who may have visited the website and seen ‘hey, the beta is closed’, but is interested in picking up the game when it comes out- what do you have to say to them? DJ: It’s free-to-play, jump on in, and it’s a lot of fun. Go to the Xbox Store and look us up. You can sign up on our website too, we’ll send out e-mails and updates. Come join us and have fun. It’s a really fun game! Are you planning on picking up Bless Unleashed for the Xbox One / Xbox One X when it comes out in 2019? Are you participating in the beta?